Every now and then, we all need a break, especially those from the city! What better way to relax and have some fun than to go out in the country and spend some time with farm life. Whether your farm adventure includes enjoying animals in a petting zoo, going for a horse back ride or a hay ride, or many other fun farm activities, the whole family is sure to have great fun! In the West Michigan area, there are many places to visit with the family for a fun day on the farm. How about picking some fresh fruit right from the orchards? 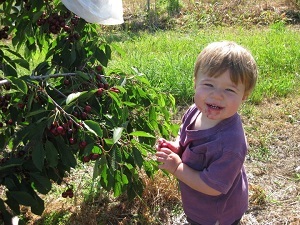 There are many U-Pick farms in the area to get the freshest, juiciest, most delicious fruit from, and the whole family can have fun picking their share! Or visit a farm market in the area and get fresh fruit and produce that was just picked the morning of, as well as homemade baked goods and other delicious delights. At the end of the day, no matter which activity you choose, you'll feel refreshed and relaxed after a day outdoors. Children love to spend time with animals, getting to know them in the petting zoo. It's such a fun learning experience, and a great way to expose your children to the outdoors and farm life in a family friendly atmosphere. Below are local petting zoos and family friendly farms to visit. Every year, the Western Michigan Fair is held at the Mason County Fairgrounds, and several other surrounding locations. The Fair is a great opportunity for a fun family experience, especially for children. Families can enjoy the amusement park rides, 4-H exhibits, as well as many other activities including the Demo Derby. The Mason County Fairgrounds in Ludington is a busy place from May-October, with a variety of horse shows for the equestrian. 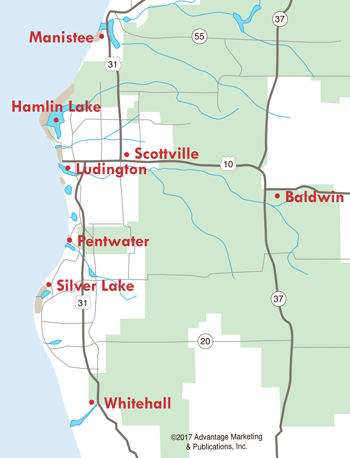 Throughout the season Ludington plays host to the Mason County Saddle Club Open Horse Shows, Gold Coast Futurity Horse Shows, and the MIHA District IX Meet. See the horse show schedule for the summer here. Nothing beats riding a horse through a field or trail, feeling the wind on your face and sun on your back, and the strong muscles of the horse along your legs. Whether you're a pro at riding a horse, or you've never had the opportunity to hop on a horse's back, these horse ranches are sure to provide a fun-filled day of horseback riding! There's no fruit or produce better than fresh-picked off the farm! Especially when you can pick for yourself! Visit this page for local U-Pick farms. How about some homemade bakery items and treats to add to your day? Or fresh fruit and produce from local farms, picked the morning of? It's important to know exactly where your food comes from, and the process it takes to get to your plate. By shopping at a farm market, you can be sure to get your hands on fresh food from local farms who can control exactly what happens to all the food, so you know where exactly it comes from. Have you ever wanted to stay the week on a farm to experience the farm life? Or maybe just to enjoy your time in the country? Bring the family to Windswept Farm, a charming farmhouse near Ludington, which features alpacas, miniature horses, Shetland sheep and more. Kids will absolutely love the variety of animals at Windswept Farms. They're very gentle and are extremely wonderful with children. The four bedroom, two bathroom house includes a deluxe kitchen and can accommodate 10 people. It's definitely a "home away from home" and makes for a really nice family vacation. Are you looking for a barn venue to host a special event such as a family reunion? Shagway Arts Barn is the perfect setting to have a special event. There's even a gazebo tent available to set up in the surrounding 40 ares! The Barn and many of the surrounding areas are handicap accessible, as well as the bathroom on site. For more great vacation ideas for the family, read our family fun story.